The Lorain Sports Hall of Fame Museum in the St. Joseph Community Center is closing its doors to visitors temporarily, as of today, to prepare for its move and reopening at the new Lorain High School in August. Meanwhile, you can still “visit” much of our collection right here on the pages of our website. “Like” our page on Facebook, too, where we’ll also keep you up to date on the move. The museum will be reopening at the new school in August. Stay tuned for dates and details. Tickets are now on sale for the 47th Annual Lorain Sports Hall of Fame Enshrinement Banquet, May 12 at DeLuca’s Place in the Park. Tickets are a donation of $30 each and can be obtained by calling Ticket Sales Administrators Taylor or Carl at the School Employees Lorain County Credit Union office in Lorain at 440-282-4600, ext. 403. Also, ticket order forms and Program Book advertising forms can be downloaded here. Inductees include Christopher Dore, Gary Huff, Holly Koepp, Lillian Saez, Jonathan Senters, Tim Jenkins, William “Pete” Smith, Tom Bauer and the Lorain Catholic 1990 Baseball Team. The Lorain Sports Hall of Fame has chosen its Class of 2016. Four of the enshrinees were standouts at the original Lorain High, four others at Lorain Catholic, while also selected was a Pennsylvania native who has devoted his adult life to Lorain athletics. The Lorain High grads are Gary Huff, Lillian Saez, Tim Jenkins and the late William A. “Pete” Smith. Gary Huff was a wrestling and football star. In 1982, Huff was ranked second in the state in his weight class, won sectional and district championships and was the Most Valuable Wrestler in the Buckeye Conference. His career mark was 66-12 with a school record 53 pins. In football, Huff was special mention All-Ohio as a lineman. Huff later served as an assistant football coach at Lorain High, Admiral King, Brookside and Westlake. Lillian Saez won the Division I state championship in the 400 meters in a time of 54.9 in 1988. She was regional champ in that event and district champ in the 200, 400 and a member of the winning 1,600 relay. Lillian also won titles at the Comet Relays and the Lorain County Relays and was selected Erie Shore Conference Girls Track Player of the Year in 1988. Tim Jenkins and William A. “Pete” Smith were selected for the Senior category. Tim Jenkins was an honorable mention all-state defensive tackle in 1968 and received a full ride for football to the University of Akron. As a heavyweight wrestler, Tim finished first in the Buckeye Conference, District, and placed second in the state meet. William A. “Pete” Smith was a 1924 graduate of Lorain High where he was an outstanding fullback in the football single-wing formation. He was named to the All-Big 7 Conference first-team. Smith continued his career at Baldwin-Wallace College, earning three letters. Smith, a longtime revered teacher at Lorain High, also served as Recreation Director for the City of Lorain. Selected from Lorain Catholic were Chris Dore, Holly Koepp, Jonathan Senters and the 1990 baseball team. Chris Dore, who starred in soccer, led the state of Ohio in goals scored in 1995 with 42. He totaled 128 career goals, 8th highest in Ohio scholastic history. Dore was chosen All-Ohio twice and was named to the U.S. u18 National Team 3 times. Dore was a four-year starter at Bowling Green State University where he ranks 6th in all-time points scored. He played five years of pro soccer and for the Cleveland Force in the Major Indoor Soccer League. Dore is currently the head boys soccer coach at Avon High School. Holly Koepp is the city of Lorain’s leading basketball scorer with 1,752 points and rebounder with 1,024, being one of the rare Lorain Countians to have 1,000 points and 1,000 rebounds. Scoring-wise, she averaged 25.6 per game as a junior, and 25.9 as a senior in 1998-99. Koepp holds the county record for rebounds in a season with 351. She was first-team all-state twice. At Baldwin-Wallace, Koepp was a three-time selection as all-OAC as she compiled 1,150 points and 737 rebounds in her career. Jonathan Senters starred in football and baseball. In football, he was first-team All-Ohio and Lorain County Division 3, 4 and 5 Offensive Back of the Year in 1994. He rushed for a school career record of 3,149 yards. In baseball, Senters was honorable mention All-Ohio in Division 4. His career batting average was a school record .455. He played collegiately at Carson-Newman College, a Division 2 College World Series qualifier. Senters made the All-SAC Tourney team. The 1990 Lorain Catholic baseball team, coached by Jim Macholl, reached the state championship game before falling to Coldwater 13-10 in the title contest. Along the way, the Spartans defeated Open Door, Richmond Heights, Mogadore, Dalton, Frontier and Rootstown, then in the state semi-final, edged Cincinnati Country Day 5-4 in a thriller. Top pitcher was Graig Mogus, who was 9-0 that season while Todd Bokulich was an offensive standout. This year’s enshrinee in the Special Category is Tom Bauer, a graduate of St. Vincent Prep in Latrobe, Pa, who came to Lorain in 1968 as a teacher-coach at Lorain High School and continues to be active on the local sports scene. Tom was an assistant football coach at Lorain High, Admiral King and Whittier Junior High for 40 years. He was a wrestling official from 1976 until 2014, being chosen Greater Cleveland official of the year in 2012 and was inducted into the Ohio Wrestling Officials Hall of Fame in 2013. Tom has managed sectional and regional wrestling meets. Bauer and his wife, Nancy Domanski Bauer, also are both members of the Lorain Sports Hall of Fame Committee. This year’s LSHOF enshrinement banquet will be held Thursday, May 12, at Deluca’s Place in the Park. Ticket arrangements will be announced soon. Zion Cross, at left, of Lorain High School was honored by the Lorain Sports Hall of Fame with a plaque for being named All-Ohio 5th place in the 100 meters in 2015. 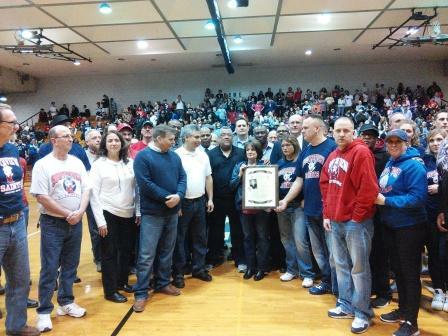 Making the presentation is Bill Rufo, LSHOF vice president, at the Feb. 5 Lorain-Maple Heights basketball game. 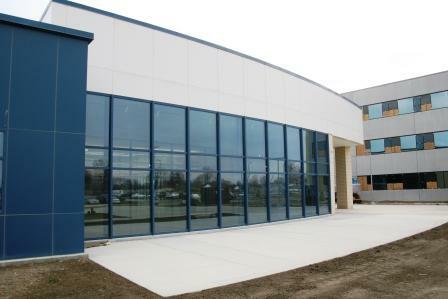 Another look toward the museum space entrance, with the outdoors to the right, and the school cafeteria beyond the wall on the left. — at Lorain, Ohio. The Lorain Sports Hall of Fame is seeking donations from the public to cover the cost of moving and displaying our collection at our new museum site in the new Lorain High School, as of Aug. 1, 2016. Donations can be made by check or securely online with PayPal. You can find more information and donate here on our website. 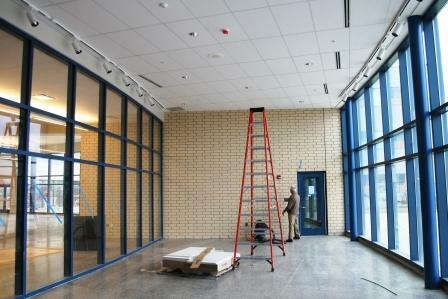 The Lorain Sports Hall of Fame Museum is to be located behind this glass wall at the new Lorain High School. — at Lorain, Ohio. 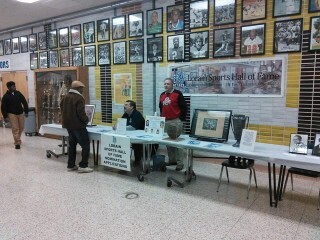 Tom Bauer and Bill Rufo at the Lorain Sports Hall of Fame display table, during the Lorain/Clearview basketball game on Jan. 16, 2016. 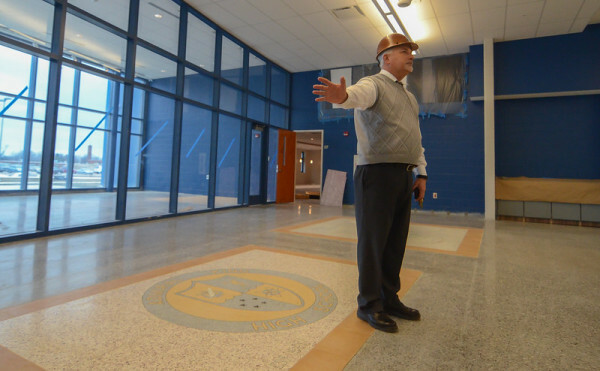 A new home for the Lorain Sports Hall of Fame is taking shape inside the new Lorain High School, as a Dec. 27 story in The Morning Journal notes. For more on the new school, click here.